How do I re-key using SmartKey? 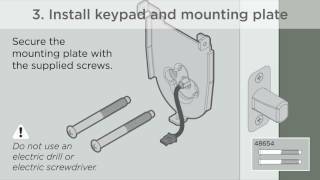 Watch this video on how to re-key using Smartkey. 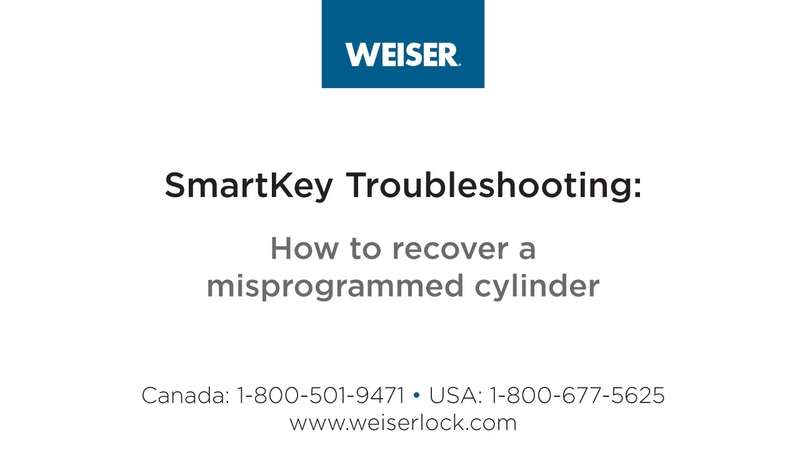 How do I recover a jammed or misprogrammed SmartKey cylinder? I have an old Weiser key, will it work with SmartKey? SmartKey is available in an ANSI Grade 1 deadbolt- certified the highest level of residential security. SmartKey offers BumpGuard™ protection, to protect against lock bumping, an attack technique that can defeat conventional pin and tumbler locks. 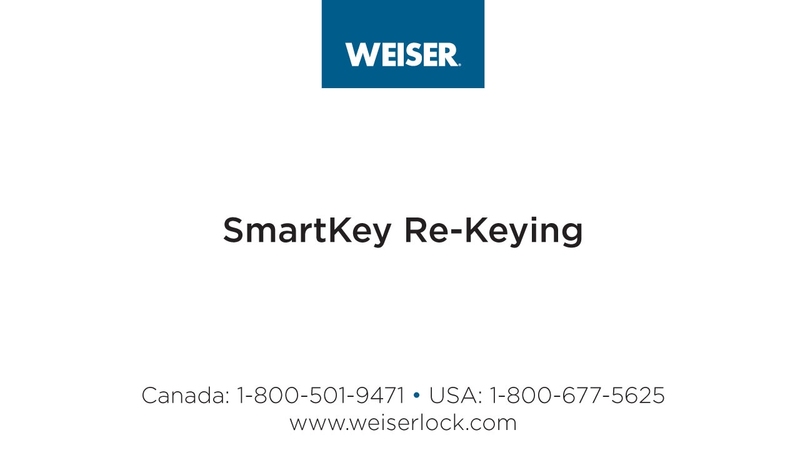 SmartKey is pick-resistant and passes the highest test standard against lock picking—UL 437. SmartKey provides the flexibility to re-key your locks, yourself, in seconds, as frequently as you wish. If you lose a key or loan out a key that you didn't get back, you can re-key your locks and secure your home in seconds. Where do I get extra keys if I want to re-key my SmartKey lock? 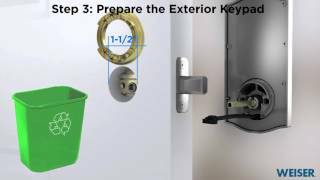 You can purchase online or in most retail stores the Weiser SmartKey Re-Key kit. The kit comes with 4 pre-cut replacement “everyday” keys and 2 pre-cut “temporary” keys. Use the “everday” keys to quickly re-key your SmartKey locks to a new key. 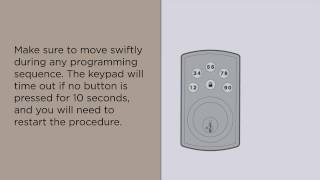 Use the “temporary” keys to re-key a specific lock for temporary access for a housekeeper, guests, or contractor. You can also purchase extra keys at any hardware store. SmartKey is compatible with the KW1 keyway. 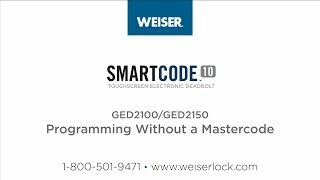 Is a Weiser lock with SmartKey re-key technology more secure than a traditional pin and tumbler lock? If SmartKey is so easy to re-key, what will prevent someone from being able to re-key my locks? SmartKey locks can only be re-keyed if you have the current functioning key and the SmartKey Learn Tool. If someone does not have the current functioning key, then that person will not be able to re-key your locks. After I re-key a SmartKey lock, will I need to keep my old keys that don't work the lock anymore? No, by re-keying your lock, your old key is now obsolete. The new key becomes the current functional key that works with your lock and can be used to re-key your lock in the future. Am I limited to how many times a SmartKey lock can be re-keyed? No, you can re-key a SmartKey lock as often as you'd like. What happens if I lose my current key? If you lose the functioning key(s), you would need to either take the SmartKey lock back to the home improvement retailer or an authorized Weiser locksmith to reset the lock, just as you would with any conventional lock. Once reset, SmartKey will function normally. For many years, Locksmith Professionals have utilized several methods and tools to bypass pin and tumbler locks for legal purposes. One such technique is called "bumping". Lock bumping, also refered to as key bumping is an attack technique using specially cut keys, known as bump keys, that can defeat conventional pin and tumbler door locks. How is Lock Bumping Done? Lock Bumping uses the basic principles of physics by inserting a specially cut 'bump-key' (also referred to as a 999 key) into the lock, then by using any type of object the key is then struck or 'bumped'. The energy transferred from the impact forces the pins within the lock up above the shear line for a fraction of a second enabling the lock to be opened. What makes SmartKey unable to be bumped? SmartKey's side-locking bar technology eliminates the typical sheer line, pins and tumbler mechanisms in its design, which are the most vulnerable points in conventional residential locks. Is lock-bumping the same as lock-picking? No, lock-picking is actually the act of unlocking a lock by manipulating the components of the lock device, without the original key, which requires a pretty high level of skill and practice. What is being done to prevent Lock Bumping? State and federal laws prohibit the distribution of 'locksmithing devices' to anyone other than lock manufacturers or others with a recognized legal purpose. Weiser is working closely with the industry trade association, Builders Hardware Manufacturers Association ('BHMA'), to minimize the risk that such devices can be obtained by individuals for improper purposes. How do I get warranty replacement parts? Proof of purchase (copy of the receipt or barcode) is required to get replacement parts under warranty. (Warranty covers the original purchaser of the Weiser product). Call us at 1-800-501-9471 and a Consumer Service Representative will be more than happy to assist you. If you are not completely satisfied with your purchase, you may return the product to the original store you purchased it from along with the proof of purchase (original sales receipt) for refund. Please review return policy from your sales receipt as the return policy may vary from store to store. 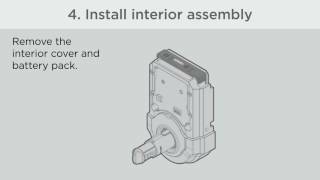 Weiser can ONLY be responsible for replacing locks or lock components concerning a warranty issue. Proof of purchase (copy of the receipt or barcode) is required to get a warranty claim started. (Warranty covers the original purchaser of the Weiser product). Call us at 1-800-501-9471 and a Consumer Service Representative will be more than happy to assist you. My lock broke, what can I do? Are you looking for support on an electronic product? Are your electronic locks made for Canadian winters? Our locks are tested and manufactured to be as weather resistant as our normal deadbolts. So yes, Winterpeg or Saskatoon, our locks will work on your door! What batteries should I be using? 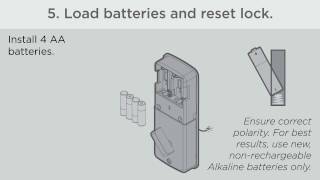 We recommend that you use a premium alkaline battery for all of our electronic locks. Go to our How-To Centre for installation videos. Or you can find your product from our Product Selector for PDF instructions. Where can I find drilling templates? For what door thicknesses are Weiser products designed? Standard door thickness is 1 3/8”-1 ¾”. Thick door screw pack (not provided together with the unit) is needed if the thickness of the door is 2 ¼” (please contact 1-800-501-9471). Door hole diameter (crossbore) 2 1/8” Edgebore 1” Backset 2 3/8” or 2 ¾” adjustable. The 'Reversible Lever' function allows you to install the leverset on either a left hand, or a right hand configured door. The lever can be removed from the rosette assembly and switched with the other lever. This prevents the levers from being upside down when installation is complete. How do I use the emergency key on a privacy lever or knob? Place the screwdriver end of the key into the centre of the hole. Slowly insert the key until it stops. Slowly turn the key clockwise until the key falls into the groove (the emergency key will be pointing to the 10 to 4 position in relation to a clock when in the groove). Turn the key to the left to unlock the door for a lever, and turn the key to the right to unlock the door for a knob. For emergency situations you can also use a normal flat head screw driver that will fit through the hole to unlock the door. How do I clean my Weiser products? Click to view our care instructions. BHMA CertifiedANSI/ BHMA (Builders Hardware Manufacturers Association) Grading System is accredited by the America National Standards Institute (ANSI), a private non-profit organization that administers and coordinates the voluntary standardization to develop and maintain performance standards for builder's hardware. ANSI/BHMA standards set forth different product grades for door hardware products. These product grades are defined by progressive levels of performance benchmarks in each applicable standard. The purpose of each is to help identify the quality and durability of locksets through a series of operational and security tests. UL Standards and the Underwriters Laboratories is an independent product safety certification organization. UL 437 is a security rating that provides a barometer for the security of a keyed lock. Our Weiser deadbolts, featuring SmartKey Re-key Technology, met the UL 437 11.6.1 pick test, one of the toughest picking tests in the world. During the test, picking tools are used to manipulate the components of the lock device, which requires a high level of skill and practice. According to ANSI standards (ANSI Code 156.2, Series 4000), the following scale is used to grade locks. Each grade specifies minimum acceptable requirements for operation, key torque cycles, pull strength, impact resistance and finish. Grade 1: Weiser products meeting Grade 1 status. Weiser Deadbolt, which also passed the most stringent lock-picking tests, the UL 437 lock picking test, and the Japanese picking test. At Weiser we are committed to improving your security with quality door hardware products. We also have prepared the following checklist to help you make your house a safe place to be. Install a wide-angle peep hole. Entrance doors should have a solid core. 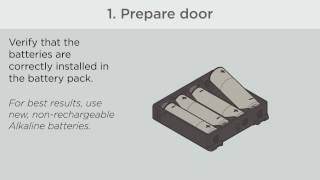 Doors should fit tightly into door jambs and strike plates must be secure. If hinge pins are outside, they should be non-removable. When closed, sliding doors need a metal bar to fill the inside track. Door locks should be replaced after you take possession of your new home. Double hung windows should be pinned. Metal windows need a lock or metal bar in addition to a catch. Basement windows should be Plexiglass or have security bars. Curtains or blinds should fully cover windows. Air conditioners should be secured from the inside. Keep shrubs cut below window level. Your house number should be easily visible from the street. Make sure front and back doorways are well lit or spot lit. Keep bicycles, lawn mowers, and other gear inside and out of sight. Join Neighborhood Watch and Operation Identification, and display the decals on your front and back doors. Keep your garage door closed and locked when not in use. Remove vehicle keys and lock vehicles in the garage. Have a light inside the garage. When moving in, have the superintendent change the locks. If you are out, arrange for deliveries to be received by the building superintendent or a neighbor. Have a neighbor or friend pick up hand bills and mail. Arrange to have snow shoveled and the grass cut. Do not open the door until you confirm the person's identity. Never indicate that you're not home on your telephone answering machine.